Walking among the muted browns and greens and soft contours of shrubs and trees of Harvard Forest’s eastern hemlocks, it’s impossible to miss David Buckley Borden’s mark on the landscape. 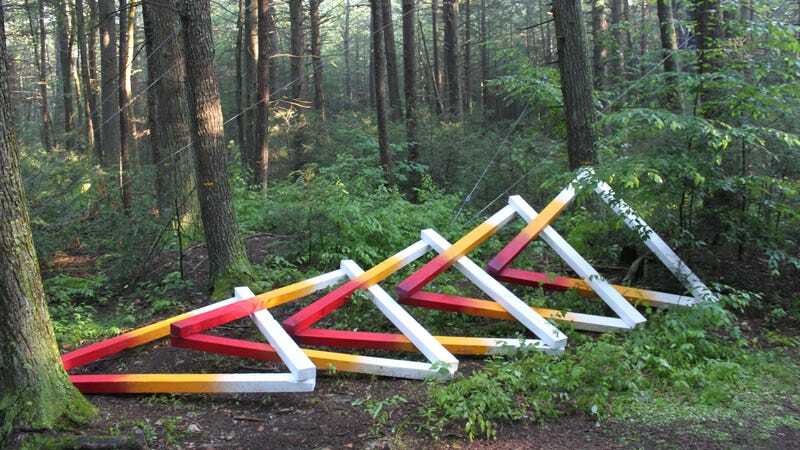 His built structures and angular sculptures painted in white, yellow and orange tones stand out like neon signs in the wilderness of central Massachusetts. And in a way, that’s what they are. Each of the 12 pieces installed is a warning sign that you’re walking among the living dead. The towering evergreens’ fates were decided in 2004. That was the last year temperatures dipped below -13°F in forest located in Petersham, Mass., about an hour west of Boston. By the following year, the woolly adelgid, a stick, white insect, had infested the forest. In 10-15 years from now, the insect will have snuffed out all the hemlock trees in the forest, leaving only gray ghosts standing as a testament to what once was. Borden has spent the past year collaborating with ecologists on the project, which blends research and landscape art to move findings from academic journals back to the forests where they were discovered. The public installation is dubbed Hemlock Hospice in acknowledgment that all that we can do for the forest now is palliative care. In viewing it, visitors are forced to confront death on the landscape and the reality that we’re all accomplices. The hemlocks in Harvard Forest are at least 200 years old. They’re considered a late-successional species, which means that unless there’s a major disturbance, the forest will likely stand indefinitely. Enter the woolly adelgid, a species of insect native to Japan that arrived on United States’ shores in 1951. While mountain and western hemlocks are resistant to them, the eastern hemlock hasn’t been so lucky. The adelgid feeds on the starches stored in young needles and twigs of hemlocks, eventually killing the canopy. Cold weather had served as a check on adelgid. But climate change has pushed the temperature higher and winter cold snaps have become less common. That’s allowed the woolly adelgid to thrive in southern hemlock forests and expand in northern ones. “You can basically track its northward success by the last time we had minus-25°C—minus-13°F for an American audience—in the winter,” Aaron Ellison, an ecologist at Harvard Forest who worked with Borden, told Earther. “That’s about 1980 in Groton, Conn., 1990 in Storrs, Conn. and 2004 in Harvard Forest. You can track it up the Eastern Seaboard as the climate warms. The woolly adelgid has been found in eastern hemlock forests as far north as Maine and as far west as Michigan. And to the south, the insect has already hollowed eastern hemlock forests in the southern portion of their range, which extends to Georgia. Borden, an artist and designer based in Cambridge, Mass., heard about Ellison’s research and applied for a fellowship at Harvard Forest. He got it and Hemlock Hospice is the result of a yearlong collaboration with Ellison and other scientists at the research site. He said the first few months were spent learning from scientists, going to seminars and on field trips including to the ghost hemlock forests of Connecticut. But beyond seeing the fate that awaits Harvard Forest’s hemlocks and understanding the science, Borden also learned a lot by hanging out at the water cooler and coffee machine with researchers. Both the academic findings and those more intimate connections with researchers are reflected in the works of art in the woods. The bright colors in Borden’s sculptures draw inspiration from both the flagging tape ecologists use to mark sites so they stand out as well as the oranges and reds used on maps to show how much the planet will warm. In one piece, dubbed the Memorial Woodshed, Borden and a team of production artists built a structure around a hemlock stump and the black birch seedlings growing around it. It’s an homage to the dioramas seen in natural history museums as well as the Harvard Forest museum. Another, dubbed Fast Forward Futures, points a banked row of triangles reminiscent of both delta (the Greek symbol for change) and the fast forward button toward the black birch that will likely replace the hemlocks. The adelgid has already caused the canopy to thin 25% since it took root in 2005 according to Ellison. Harvard Forest is a particularly unique place to site the project. It’s part of the Long Term Ecological Research program, a series of sites across the United States dedicated to monitoring ecosystems indefinitely. The sites provide a baseline against which future changes can be measured. Ellison said Hemlock Hospice is a way for scientists to turn off the statistical side of their brain and turn on their emotional side. For him, that’s been about confronting his own work and why he does it. It’s a unique reflection for scientists, but there’s another, bigger audience out there both Ellison and Borden want to reach. With miles of public trails just a short trip from Boston and its growing suburbs, Harvard Forest is also a popular place to take a hike to enjoy the foliage in the fall or quiet snowshoe in the winter. Borden said that accessibility helped him decide to make an installation in the woods rather than a gallery. Most visitors probably weren’t going to get a lesson on climate change either, which gives the exhibit the chance to reach people completely unprepared for what they experience. Though the exhibit will come down in November 2018, the forest’s transformation will continue. The towering gray ghosts of the hemlocks will eventually give way to black birch and other hardwoods. When that happens, something will be irrevocably lost. Though the forests will still be green, Ellison said the hemlocks perform unique ecosystem services, sequestering more carbon and protecting soils against erosion better than their hardwood counterparts. But beyond ecosystem services, humans will also have to live knowing that we killed off a tree that has survived eons in natural balance.